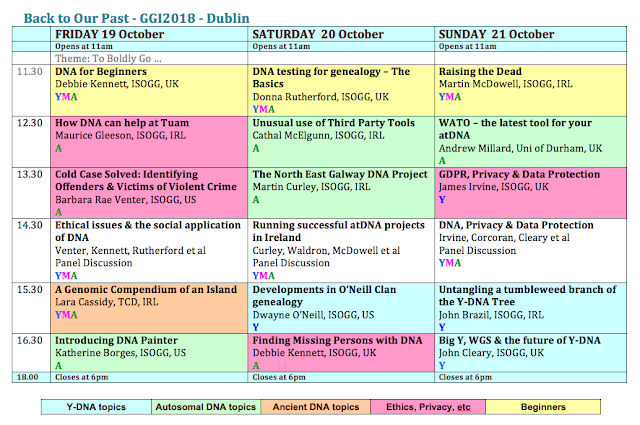 GGI2018 takes place over the weekend of October 19th-21st2018 at the RDS (Royal Dublin Society) in Ballsbridge, Dublin. Below is the final schedule for the DNA Lectures. These will take place upstairs in Dodder Suite 5A (the same room as in previous years) and will be well sign-posted from the floor of the exhibition hall (just follow the signs for DNA Lectures). It is planned to record the lectures and make them available on the Genetic Genealogy Ireland YouTube channel. A new lecture will be posted each few days following the end of the conference, so that by the end of November all the lectures will be available online. Martin gives a few practical examples of how autosomal DNA can be used to identify specific ancestors and explains how ancestor reconstruction can be used easily as a constructive tool to further your DNA research. This is something that isn't as complicated as it sounds and might just help you to break through that Brick Wall that refuses to come down. Looks like another great event. I hope to see new people attending and in particular those outside the Dublin urban area who may not have attended before.